As we continue To the Stars Week, here’s another galaxy-spanning sci-fi project designed for 5e-driven interstellar adventuring. Whether you want to expand your current D&D game into space-faring territory or start a brand new campaign, this book has you covered. Note that this is the Alpha version of Dark Matter, meaning there’s placeholder art and things are generally not quite as polished while they adapt to feedback to update the thing. You’ll get the automatic updates without any additional cost, but you probably want to hold off on printing anything out until they get past Alpha stage. Dark Matter is a full science fiction conversion for 5th Edition that unlocks a universe of adventure for your table, without leaving your favorite fantasy staples behind. The core book is is over 250 pages and will grow and improve as we add the finishing touches. Everything in Dark Matter, from character options to space combat, is easy to learn, generic enough to use with any sci-fi setting, and made to work with 5th Edition. We take great pride in making sure that everything we write is fun and balanced for everyone who plays. Dark Matter is for any player or GM who wants a little more sci-fi at their table. 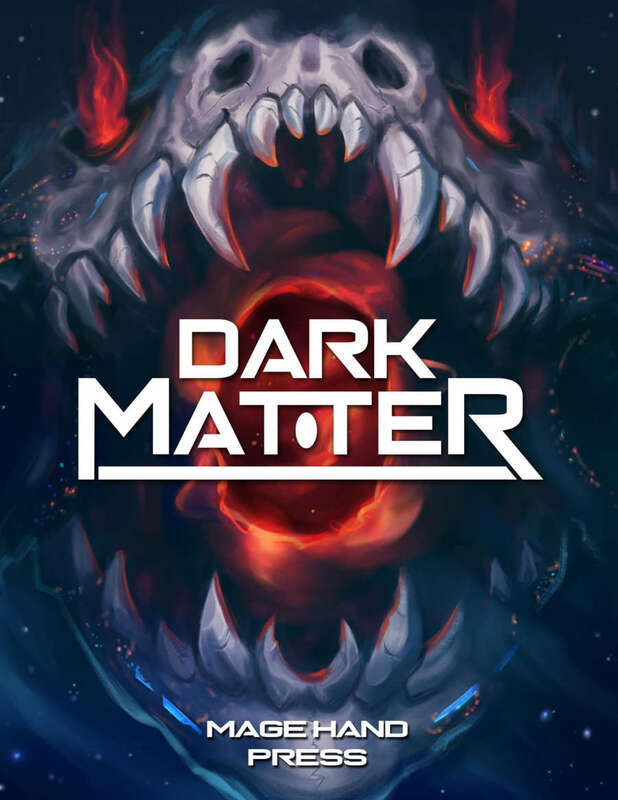 Though it’s a full campaign setting, Dark Matter is designed with flexibility as a top priority: the rules and options in Dark Matter can seamlessly be applied to any 5E campaign from the definitely-not-Star-Wars settings the to all-inclusive fantasy games. You need Dark Matter if you want to throw a blaster, laser sword, or starship into your next game, even if it’s only for one session. The ‘Verse: An introduction to the universe at large, providing the all-important top-down view on everything. This chapter details much of the ‘verse’s history, outlines all the major races, introduces all the major factions, and gives some insight in how to adventure around the galaxy. Races: Six new playable character races, plus an extremely customizable human subrace, to inhabit the ‘verse alongside the usual fantasy standard of elves, dwarves, gnomes, and so on. Your next character could be an Amoeboid, a shapeshifting ooze-person, a Vect, a living construct of magical technology, or an Avia-Ra, a bird-headed sun worshiper. Gadgeteer: A highly-customizable technological base class (complete with four subcalsses) that uniquely belongs in the Dark Matter universe. Character Options: A swathe of archetypes for every class in 5E core; plus a handful for Mage Hand Press classes, a deluge of new feats, a host of new backgrounds, and three new skills. With these options, you can finally play the tech-savvy gnomish space marine or the dashing elven starship pilot you’ve always longed for. Monsters: A bestiary full of alien critters from the adorable thrwirrel to sinister wandering rift. These creatures, all of which come with full descriptions and statistics, should provide a sci-fi challenge all the way from 1st level to 20th. In addition, the Monsters chapter comes stocked with a vast array of NPCs, ready to pilot opposing vessels and populate humanoid factions. Spells: A catalog of spells to influence technology, harness hardlight, and travel the universe. From cantrips like technomancy, which give some harmless tech-manipulation, to the devastating orbital hardlight cannon (which is a magic space cannon that is every ounce as cool as it sounds), there’s spells for every caster of every class and every level. Appendices: The appendices of this book are a treasure trove of world-building fun, including tables to randomly-generate exotic alien planets, a breakdown of neat spacer lingo, a d100 table of plot hooks, and even a helpful unit reference and conversion guide!